Taking advantage of ICA Free Thursday Nights last week, I strolled across the Old Northern Avenue bridge to checkout the new exhibit, Fiber: Sculpture 1960 - Present. 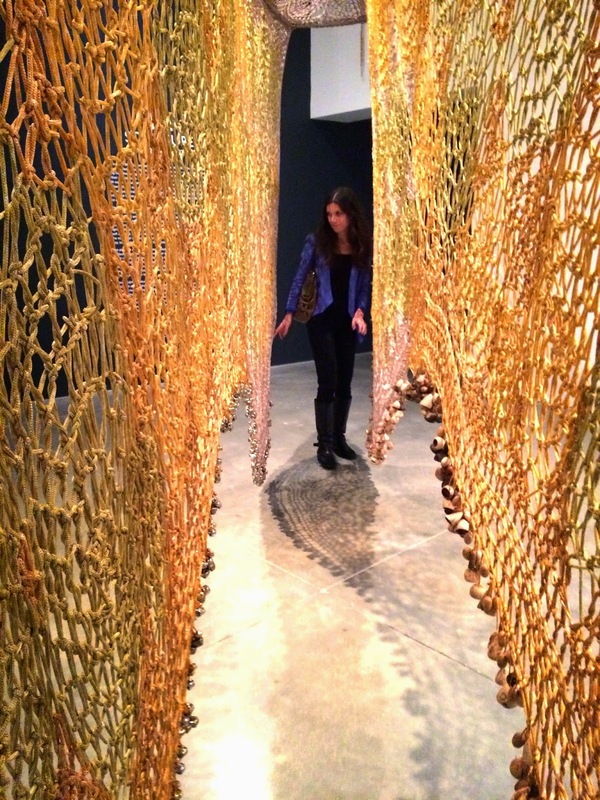 The exhibit showcases thirty-three innovative artists in the 1960s who tested the limits of fiber by using it as a medium in sculpture. Upon walking into the gallery, I was overcome by a sea of vibrant colors, soft textures, and bold shapes. 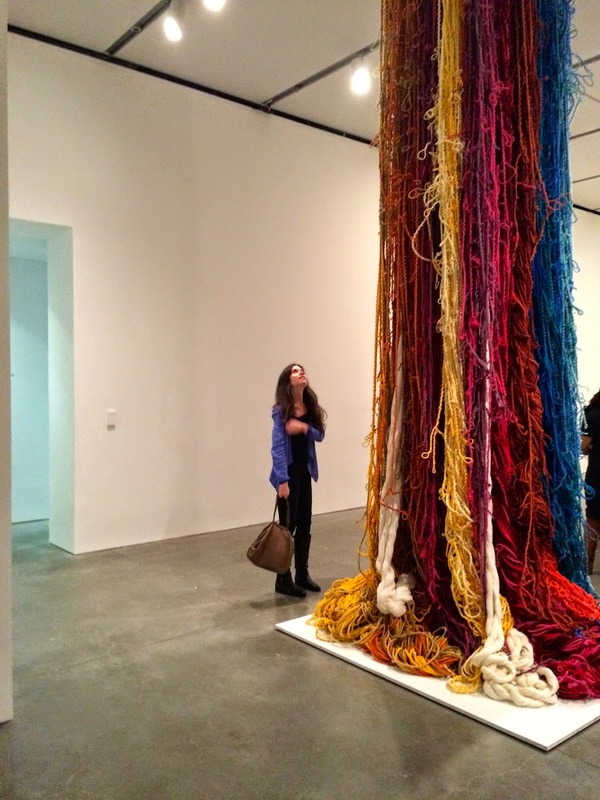 My favorite piece was Sheila Hicks' Pillar of Inquiry/Supple Column, a waterfall of fiber spirals and clinging lines streaming from the ceiling and cascading on the floor below. Visit Hicks's page HERE. I left the museum with colors swirling in my mind and was inspired to channel this creative energy into cooking. Like Kara, in anticipation of Thanksgiving, I plan to revamp a classic dish. Kara and I often serve an array of roasted root vegetables at Thanksgiving, so figured why not manipulate garnet red beets by transforming them into spirals? I was recently gifted a spiralizer, so it was only appropriator to put the unique kitchen tool to use with Sheila Hicks as inspiration. I tossed the sweet “beedles” with a Balsamic Vinaigrette, dots of tangy goat cheese, nutty almonds and red onion for a new spin on a classic side. In a small bowl, whisk together the Balsamic Vinaigrette ingredients and set aside. 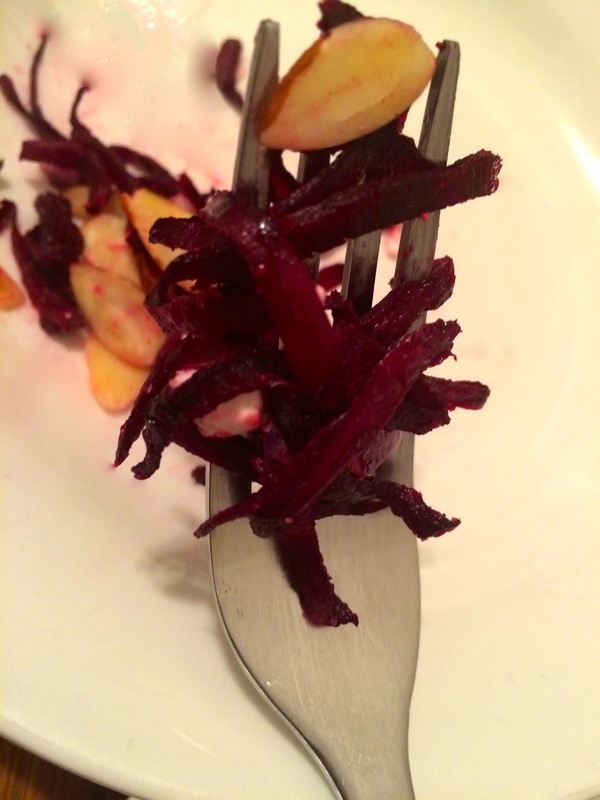 Cut the ends off the beets, peel and spiralize. 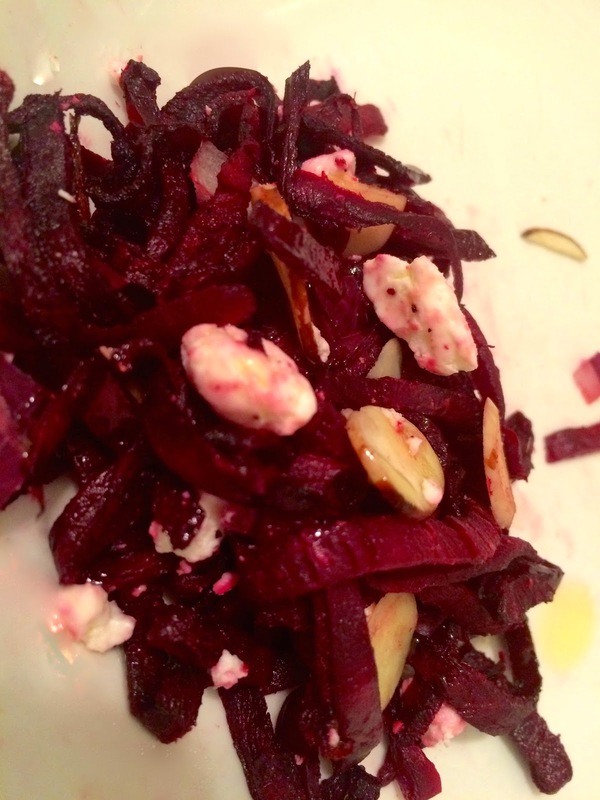 Toss the beet noodles with EVOO, salt and pepper, and place on a cooking sheet. Roast in the oven for 5-7 minutes until tender. Once cooled, toss the beet ribbons with the Balsamic Vinaigrette in a large bowl. Sprinkle the crumbled goat cheese, almonds, and red onions on top. Serves 4-6 sides. I had a blast with the spiralizer and cannot wait to use it for new spins on other vegetables. Thanks so much for the gift, Linda!